Thermal baths are one of the most amazing natural wonders you can encounter while travelling. Soaking in the relaxing hot waters is something everyone should try at least once. So, we’ve listed 21 of the world’s most beautiful thermal baths for you to check out. The Hanmer Springs resort began with a single fenced pool way back in the 1850s. Since then, a whole array of pools and baths has been added to the facility. It’s expertly furnished surroundings make it look like a public water park, there’s even a few water slides, but all of the water in the park is 100% sourced from natural thermal hot springs. 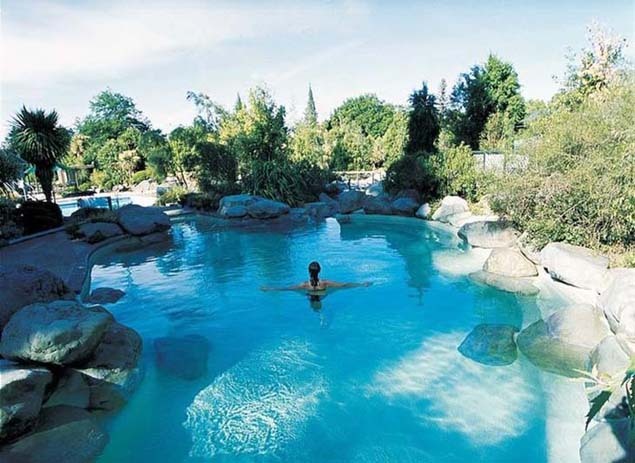 Hanmer Springs is located on NZ’s South Island, just a 90 minute drive north of Christchurch. Contrasting the previous entry in aesthetics is Landbrotalaug. It’s a very interesting hot spring and about as natural as you can get, as it’s literally a hole in the ground wide enough to fit one person. 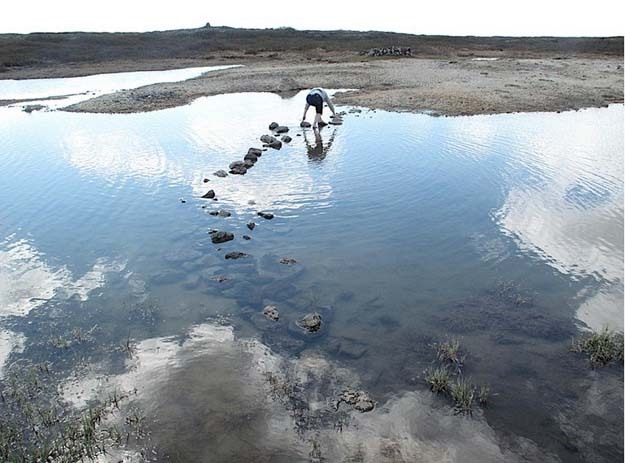 The spring is located on the south of Snæfellsnes and is only one minutes walk from the main road. To get there, you need to drive north along Road 1 from Reykjavík, through the town of Borgarnes, turn left onto Road 54 for about 40 kms and turn in to the road leading to Stóra-Hraun. Drive for about 1.3 km and you have reached Landbrotalaug. Mexico’s Grutas de Tolantongo is a rather remarkable assemblage of natural and man-made hot springs. Along with the usual spas and pools, there is actually a cave from where the hot springs flow. So not only is there a cave of thermal water, but there is an actual hot spring river flowing from the cave. You can get there from San Antonio, where there are plenty of public buses to and from the hot springs. Glenwood Springs has the honour of being home to the world’s largest natural hot spring pool. It’s claimed that the Glenwood Springs pool delivers three and a half million gallons of hot water every day. If that wasn’t enough, there is a luxurious resort built around it. Glenwood Springs is in Colarado in the US and is easy to get to from Denver. The Banff hot springs are located amongst the Canadian Rockies, making it a great place to unwind after a day of skiing or snowboarding. The hot spring is listed on the Canadian Register of Historic Places and was discovered in 1884. Located in the Banff National Park, the resort is just a short drive from Calgary. Another hot spring located in Colorado, the Cottonwood boasts a more rustic aesthetic with creek side cabins and lodges to stay in. 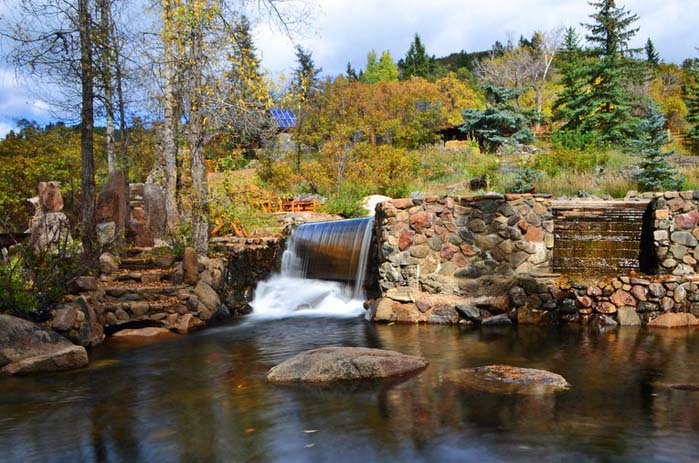 The springs here are gravity fed and are renowned for their medicinal and therapeutic value. Cottonwood Hot Springs are located on 18999 Country Road 306, just north of Buena Vista Colorado. 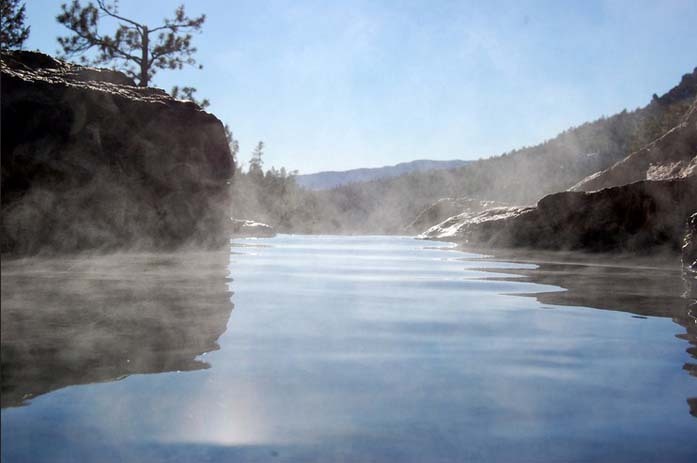 The Spence Hot Springs on the Jemez Mountains are another example of naturally occurring hot springs. The springs themselves are two pools of hot water located on the side of a hill. They give an amazing view of the surrounding mountains and are quite popular with families. Located in New Mexico, the springs are about a two hour drive out of Albuquerque. Thermal springs are often best enjoyed in a cold environment, so it makes sense that Alaska’s most developed hot springs resort would be a popular attraction. Not only do you get to enjoy the delights of the hot water, but in winter, they can also be a prime viewing spot for Aurora Borealis. The springs are 60 miles out of Fairbanks, but the tranquillity makes the trip well worthwhile. Strawberry Park combines a hot spring resort with a rustic mountain retreat. The pools are fed by a hot spring river and there a range of options including tents and cabins for accommodation. You can get to Strawberry Park by driving north from Steamboat Springs, Colorado. The resort can provide shuttles to and from the town due to limited parking at the resort. The Esalen Hot Springs have perhaps a unique claim as being one of the only hot springs that can boast clear ocean views. Located on the Californian coast near Big Sur, the springs here sit on a steep hill overlooking the Pacific. Most Mexican hot springs flow out of caves and caverns and La Gruta is no exception. Boasting three different outdoor pools of varying degrees, the hottest of which is accessed by a long stone tunnel of water that empties out into a dome shaped cave. The springs are located in the town of Guanajuato. 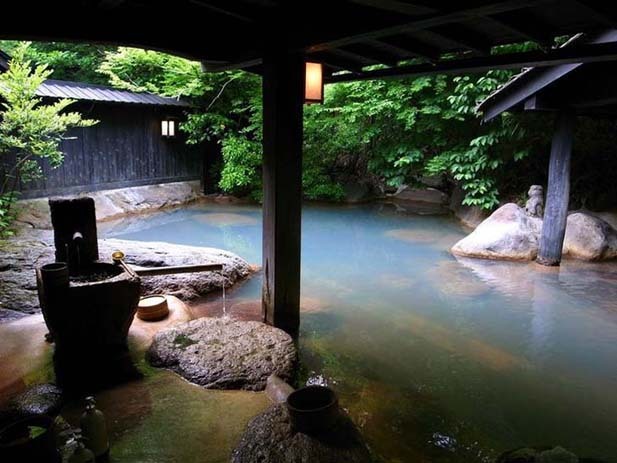 Japan is famous for its plethora of natural hot springs. Given regions of the country are rife with small bath-houses that are fed by thermal springs, so travellers are spoilt for choice. The Shizuoka region has plenty to choose from. The region is to the southwest of Tokyo, adjacent to the Fuji region, making it easy to get to. The sunburnt environment of the outback is generally not thought of as a place where hot springs flow, nevertheless there is one. These springs are located near the Mataranka Cabins and Camping site, which is itself a few hours’ drive south of Darwin. The springs at Pamukkale in Turkey are probably the most stunning of the naturally formed hot springs on this list. The pools are arranged into terraces that are made of travertine, which is a hardened sedimentary rock deposited by water from the hot springs. Pamukkale is a short distance away from the township of Denizli in south-western Turkey. Bath in England is both the only place in the UK where you can bathe in thermal waters and is also the only city that is listed as a World Heritage site. The main draw of Bath is the majestic Roman Baths that are over 2000 years old where visitors can catch a glimpse of the history of Bath. 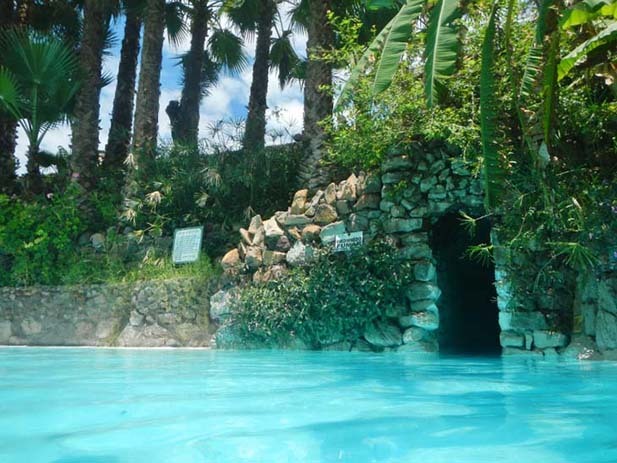 These springs are located deep within the mountains of Japan, making them ideal for those looking to experience all that Japan’s wilderness has to offer. Visiting the hot springs cove in Tofino is not a journey you can make by accident. Located on the west coast of Canada’s Vancouver Island, the trip is quite an arduous one. Once you make it all the way to Tofino, you’ll then need to book a day trip to the cove, which also consists of a 20 minute plane trip to access the remote area. 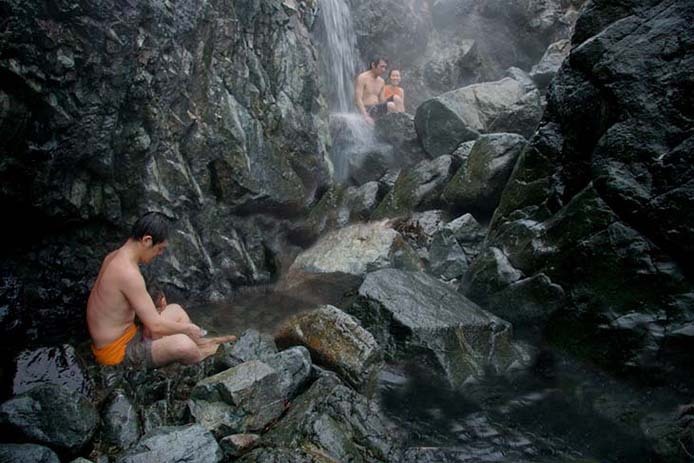 The Shirahone or “white bone” hot spring is a small resort town lying in the Northern Japanese Alps. The springs get their name from the milky white water that lies within them, which is caused by deposits of magnesium and calcium sediment. The resort in Mammoth Hot Springs is the only resort in Yellowstone that is able to be accessed by car during the winter months. 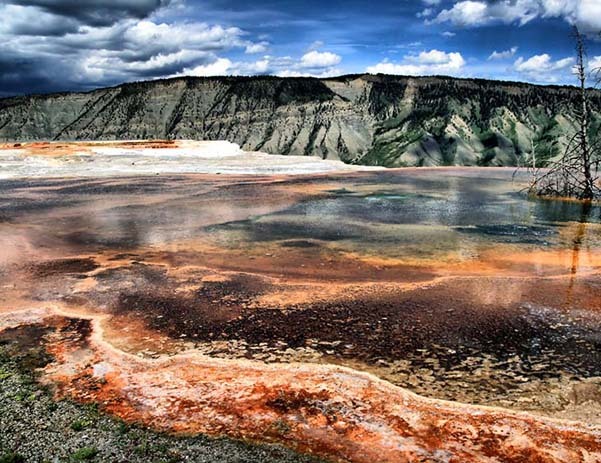 These carbonate-depositing springs are the largest in the world and are a popular destination. The Arenal region in Costa Rica consists of a range of different hot springs sites thanks to volcanic geo-thermal activity in the region. There’s close to 40 different spas and resorts near Arenal Lake, all of which provide great views of the imposing Arenal Volcano, which is thankfully extinct. Travelling to the Arenal Hot Springs is a three and a half hour drive from San Jose. Finally, we have the Jigokudani Monkey Park. 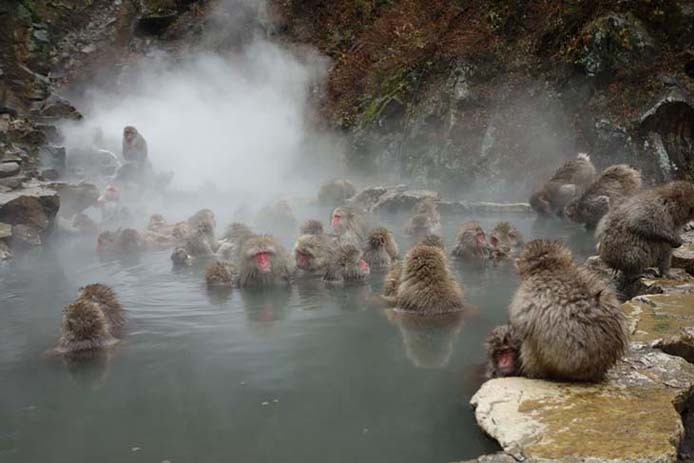 This site is so popular because it is a prime location to watch troops of Japanese macaque bathe in the hot springs. As well as tourists, it also attracts plenty of naturalists, to observe how the monkeys behave in their natural habitat. It’s approximately three and a half hours travel from Tokyo via train, bus or car.